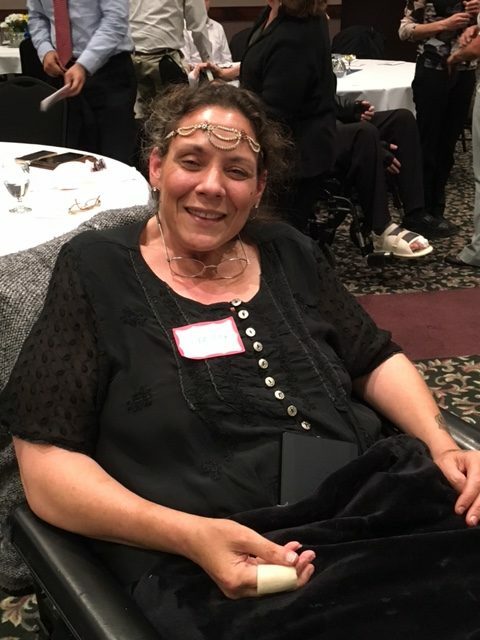 June is Acquired Brain Injury Awareness month and we would like to share a story about Jennifer, an individual in our Assisted Independent Living program. 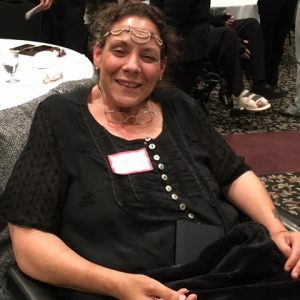 One week ago Jennifer had the courage to share her story and gave an incredibly moving speech at Fraser Health’s Acquired Brain Injury Program, Community for Everyone Awards event in Coquitlam. Below is an account of her story in her own words. In 2009, due to mounting fears of the H1N1 influenza, Jennifer’s physician recommended that she take the combination H1N1 seasonal flu shot. Several weeks later she started to notice increasingly concerning symptoms such as double vision, falling down, and inability to swallow. She went to the hospital multiple times to address these concerns without any clear answers. Prior to receiving the flu shot, Jennifer had been recovering from a severe strain of the flu and her immune system was already reduced. Unfortunately, she reports the antibodies in the vaccine started to attack her brainstem. Jennifer was admitted to hospital and while there she was placed on a ventilator and went into a coma. She was diagnosed with Bickerstaff’s Brainstem Encephalitis, resulting in an acquired brain injury. After coming out of a coma she slipped in and out of consciousness, finding herself unable to communicate with those around her. Jennifer spent 18 months in the hospital and had endured countless medical tests, persisting physical agony, and feelings of hopelessness. Jennifer started her journey of recovery at a group home in Langley and focused on recovering, increasing her strength, and mobility. She made huge strides during her time there. In 2013, Jennifer moved to one of Strive’s community support homes, located in Surrey. She reports that this is where she finally developed independence and autonomy. With the support of her Care Provider in a safe environment, Jennifer increased her independence in many different areas of her life. She is now able to prepare meals, clean her home, access transit independently, go grocery shopping, and take care of her banking. Jennifer is determined to continue to increase her independence and is always challenging herself in new ways. Jennifer’s speech at the ABI Award event blew us away and we are so proud of her progress, attitude, and willingness to share her inspirational story. Thank you, Jennifer.